The Olympic gymnast has teamed up with JCPenney to launch a fashion collection for tween girls under the new Obsess brand. 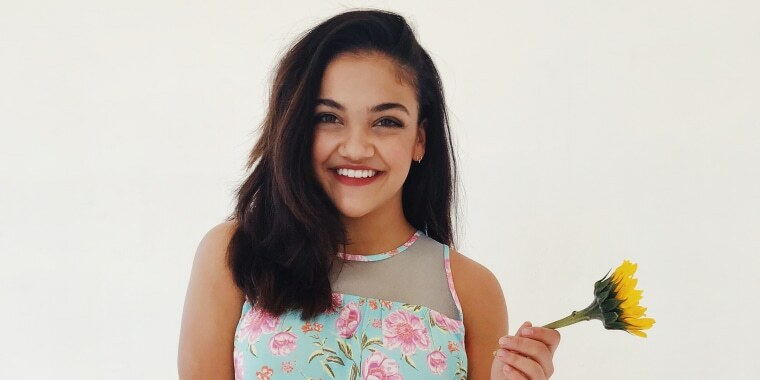 Olympic gymnast Laurie Hernandez is launching her first clothing line, and it aims to promote body positivity. The new tween collection, Obsess, coming soon to JCPenney, features tops, rompers, dresses and jeans meant to provide girls with outfit options that are both comfortable and trendy. “My line is for girls of ALL shapes, sizes & body types!” tweeted the 17-year-old TODAY Style Hero. Sizes for the line range from girls 7 through 20, making it accessible for everyone. “It’s for us to feel comfortable in our own skin,” Hernandez shares in the video. This collection is the first under the larger Obsess brand, which was inspired by how quickly tweens change their minds, and their styles, based on what they see on social media. According to a company statement, JCPenney plans to partner with different “influential young women who promote a positive body image” each season to create aesthetically different collections. Hernandez’s bubbly personality definitely comes through in the pieces of the collection. A few of her favorites include the teal bomber jacket with flowers embroidered on the sleeves, the jorts (aka jean shorts, for those of you who aren’t fluent in Gen Z lingo) and the jean jacket, which Hernandez describes as stretchy. Prices for the collection range from $22 for an embroidered top to $35 for a floral dress. Customers can shop Obsess on JCPenney.com starting on February 26 and in JCPenney stores on March 2.